Is Kosta Browne Pinot Noir Age Worthy? Spring 2012 WWP Wine Index: Who's Hot? Who's Cold? Rankings determined by what I'm hearing about, reading about, and buying. The Hottest or Coldest entities are ranked No. 1. "1984 ‪#Reds‬ rookie Eric Davis makes his ‪#MLB‬ debut and must wear a numberless jersey when Cincinnati forgets to pack an extra road uniforms." I immediately went up to our attic and got out two medium-sized boxes of baseball cards and other memorabilia that represented the best five percent I collected from 1988-1991. It's unfortunate my interest coincided with a time when a glut of cards flooded the market and the early days of the steroid scandal. These cards could have been worth something otherwise! Nevertheless we had a great time pouring over the cards. The piece of memorabilia that brought back the most pleasant memories -- quite unexpectedly -- was an old issue of Beckett Baseball Card monthly. It was the one with the black and white photo of Bo Jackson on the cover in shoulder pads with a baseball bat over his shoulders. I saved that issue, I guess, because it was going to be valuable. Leafing through the magazine, I was reminded of the many similarities between baseball cards and wine exploration. The price guide, as if anyone could fetch the prices they quoted, reminds me of the numerical ratings at the back of Spectator. The interest in catching cards from rising stars before they became too expensive is similar to discovering hot new producers before their mailing lists are full. The cards are produced each year, like vintages of wine. The list goes on and on. But the single best page in the magazine, that I'd completely forgotten about, was the Weather Report. A completely arbitrary list of who and what was Hot and Cold. A combination of rising stars, reliable veterans, collectible sets, and disappointing players. Readers loved to read and react to the list as it was updated each month. You were so savvy to have caught a player before he debuted on the list with a "NR" (not previously ranked). And you were indignant when your favorites fell from glory. Like it or not, the list seemed to have its finger on the pulse of the hobby. So I thought it would be fun to create the same sort of list for wine. Should outs to @AndyA3 @MoralBeast @wineduggery and @jmfran1 for sharing their thoughts already. My intent with this list is to capture wine producers/categories/regions/stories that are surging in popularity -or- falling out of favor for one reason or another. Wineries with mailing lists that are hard to crack. Winemakers who seem to have the magic touch. Categories that people are talking about this season. Reliable producers who never seem to fall out of fashion. Wineries who, if their wines were offered by a retailer, would cause you to stop what you're doing and take note. Wines you hardly ever see at retail. Categories that are being ignored because they present a hard-to-like style or their value equation doesn't add up. Wineries that are popular with many but risk falling from their lofty perches if they can't continue to deliver. I'll acknowledge: This list is biased towards my preferences and the categories I pay attention to. But I tried to include entries I hear people talking about that I don't care for myself. Next time I update the list I'll provide commentary on the actual picks rather than taking a stroll down memory lane. I hope you enjoy this installment. What do you think? What wines are hot lately? Which are cold? With wine, the path of discovery can be as enjoyable as tasting the beverage itself. As enthusiasts we oscillate between depth and breadth: We temporarily stop and dive deep into a category until another region catches our attention. For me, I've been stuck on California Pinot Noir for a couple years. And it's unclear how long it will be before I come up for air. Within California Pinot, there seems to be a battle between lean and ripe. Between producing nuanced wines that let the vineyards speak for themselves vs. aiming to produce blockbuster wines. Within this dichotomy, even after reading several articles, it was unclear to me where Kutch Wines fits in. 38 year old Jamie Kutch worked on Wall Street before cashing in and pursuing his dream of producing wine. After being impressed with wines from producers like Kosta Browne and A.P. Vin he reached out to them for guidance - and was welcomed with open arms. A far cry from the competitive financial world he left behind. He got his start producing wines at Kosta Browne so you'd think his style would run towards ripeness. But you'd be wrong. After producing the 2005 vintage at KB he set out on his own and developed a minimalist philosophy which favors earlier picking. But like Michael Browne he prefers to keep racking -- the transfer of wine from one container to another to remove sediment -- to a minimum. The result can be a tremendous creamy, velvety mouthfeel. But only if you can still produce a wine with good clarity and avoid rotten egg aromas from dead yeast along the way. When I hear about California producers aiming for balance I sometimes fear they'll go too far. That the wines will be under-ripe and hard to enjoy. My favorite producers find that intersection between pure fruit flavors, the right amount of ripeness, and ultimately find a way to produce a delicious enjoyable glass of wine. 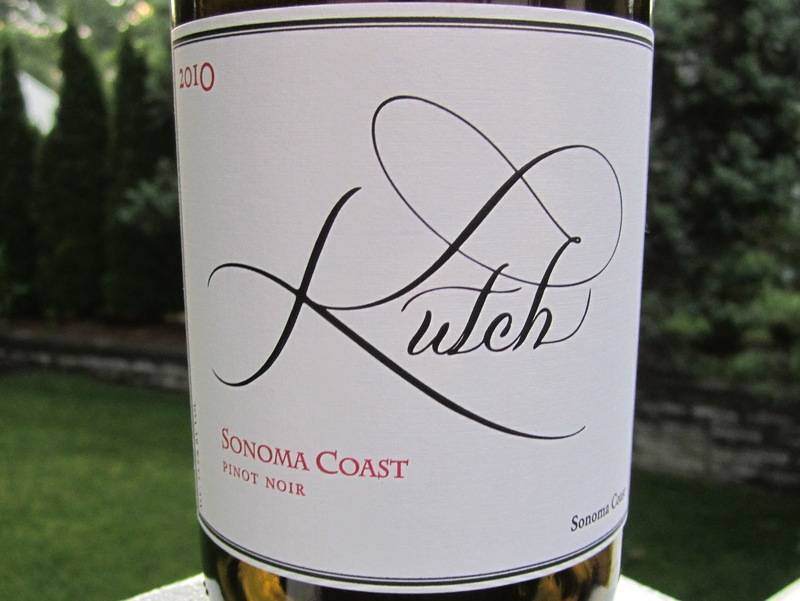 Kutch only produces Pinot Noir from Sonoma at this point. The appelation wines -- from the Sonoma Coast and Anderson Valley -- retail for $39. The single vineyard wines sell for $50. But good luck finding them at retail. Considering the modest production levels and the quality here I think these wines a good value. There's a purity of fruit and freshness here that's tremendously appealing. Light-medium bodied visually with perfectly ripe strawberries dominant and supporting tart cherry notes. It's subtle, but along with mild orange peel notes, supporting herabaceous aromatics and flavors add a perfect touch of earthy compleixty. Not an off note in the bottle. I like this. A lot. A tremendous introduction to the producer. This is a guest post from my friend Joegish from CellarTracker. Taste wines that are either vertical extensions or from a winery whose products we like or may want to purchase. Because our group decided wine was our focus and food was secondary, we chose not to rely on the food at the tasting. This decision was also influenced by the unknown of how The Mirage would handle the event, given that this was a new venue. There were also some comments written on Cellar Tracker that made us wonder how crowded the event would be. The information provided by Wine Spectator was very limited before the tasting. The only real information available was a list of participating wineries, with the actual wines being poured not disclosed before the event. Given that this was the third (and final) Grand Tasting event, some of the wines being poured were disclosed in other blogs, but the information was sketchy at best. This severely limited our ability to plan specific wines to taste. Personally, I view this lack of information as the only significant opportunity for improvement for the event. We arrived about 35 minutes before the event started and were approximately 400 people behind the front of the line. Although the ventilation was lacking, we survived the wait and entered the tasting hall with no issues. The entrance was actually rather speedy, considering the logistics involved. We were given a pen, a handy notebook with all the wineries and wines being served, and a souvenir Riedel glass upon entrance. If you have ever been to a trade show, you know how this event was set up. Two hundred 8x10 booths set up in 8 aisles. A very logical organization by region and varietal made it simple to understand and find wines. Food and tables were at the one end of the enormous hall. Other than the entrance wait, the only real crowd to be found the rest of the night was for the 1999 Ch. Margaux being poured. I am sure it is delicious; however, we skipped that line for the entire evening. We quickly discovered that there was plenty of time to taste whatever wines you wanted, so there was really no need to hurry. The food was set up as a buffet, and was rather generous with carving stations, pasta stations, etc., set up in a logical perimeter around the tables. There was no need to eat beforehand and the quality of the food seemed rather excellent. Very nice young Bordeaux. Lots of complexity and fruit. I would give this a 92 (interesting to me, this is the same as I rated the 2009 Ch. Lillian Ladouys at $24/bottle). I was very excited to see this wine as I bought a few bottles of it, but had not tried it. Wow, what a fruit bomb. Rather shocking for a Caymus Special Select – I hope the fruit fades and other flavors develop over time. Hardly even tasted like a cab blend to me. Editor's Note: This aligns almost exactly with my notes on this vintage from a recent retrospective tasting of Caymus Special Selection. I had read good things about Merus and wanted to try their cabernet. This wine did not disappoint. Complexity, depth, finish - what a cabernet. This was the first wine I tasted that I would have rated higher than WS. My WOTN. A 95 in my book and worth seeking out. This was the only wine I noticed that had not been rated yet by WS. I'll forgive WS, given that KB produced their WOTY last year. Nice pinot noir, full bodied and relatively complex. I would buy some if it were available under $50...but would probably pass on it at a higher price and would definitely not stock up on it. I'd rate it a 92. Way too young to drink yet. Some complexity and the finish was pleasant, but the fruit was overwhelmed by oak. Would not drink for at least 8-10 years. I have a bottle of this in my basement. Now I know why I wrote a 2020 on the bottle tag. Perhaps I should change that to 2030 or save it in my will for one of my children....talk about tannic. I could not drink it. As a matter of fact, I tried numerous tannic oak bombs that are just not my style (2009 Ornellaia, 2005 La Poderina, 2009 Setti Ponti Oreno, et al. These are just way too young to taste...I really do not understand how people can rate these wines in their youth and I found them generally undrinkable at this point. Bummer. 2010 Siduri Santa Lucia Highlands Rosella's Vinyard - in my book as good as the Kosta Browne served in the booth next door. 2008 Domaine Serene Evanstad Reserve - I have a few bottles of the 07, and the 08 is still a little rough at this point. 2009 Elk Cove Willamette Valley - quite nice, but pretty standard. 2008 King Estate Eola-Amity Hills Roserock Vineyard - I really liked this one, but found it odd that only three hundred 6 packs were produced...why would you feature this at a WS Grand Tasting? FYI, WS rated this one a 95. 2009 Hall Cabernet Sauvignon Napa Valley Jack's Masterpiece - this was my #2 WOTN. We learned it actually comes from the Sacrashe Vineyard in Napa Valley. We have enjoyed many cabernets from that vineyard in the past. 2009 Two Hands Lily's Garden McLaren Vale Shiraz Delicious. Personally, I would probably still go for the 09 Angel’s Share and Gnarly Dudes from Two Hands. Those 2 are both delicious and very drinkable right now. We did not try many white wines (one of our friends did love the 2010 Vina Nora Rias Baixas Nora de Neve), but did manage a few trips over to the Champagne and dessert wines rows and tried a few of these as well. The favorites of the night were the Schramsberg Reserve North Coast 2004, Luis Roederer Brut Champagne Premier NV, Veuve Clicquot Brut Champagne 2004, and the Moet & Chandon Brut Champagne Imperial NV. A lot of the WS staff attended and were fun to talk with. Tim Fish, Thomas Matthews, and James Laube were all there and chatting it up with attendees. We met a lot of interesting people and winemakers. Overall, the opportunity to try many different styles of high scoring wines was pretty amazing. The venue was very comfortable and I would recommend attending - the $200 was money well spent. Editor's Note: My sincere thanks for this guest post! I think a lot of you will agree - it's hard to tell his writing style from mine and this provided excellent insight into an event we all would have enjoyed. Question of the Day: Did you attend any of the Wine Spectator Grand Tour events this year? They were also held in New York City and Washington DC. If so, what did you think? If not, where do you think Spectator should visit next year? Back in 2009, Wine Spectator Senior Editor James Laube wrote a blog post about what he considered the perfect one-size-fits-all everyday wine glass. 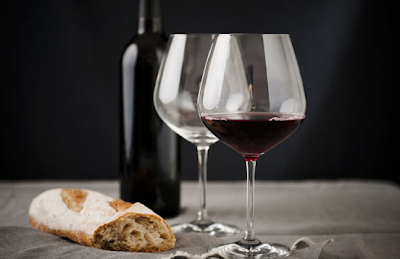 A Wine Spectator online subscription is required to read the full post, but the glass he highlighted was "the Tritan Burgundy Glass by Schott Zwiesel 'Forte' (model 8465/140)". I think you want the larger 24.7-ounce glass, so the Claret Burgundy is the one to get. The smaller glasses are fine, but for me these slightly larger glasses are just right. Now, if you Google "schott zwiesel 8465/140" the first thing you'll hit is K&L Wine offering these - but the size they quote is 8 5/8" tall, 21.1 oz. capacity. What the heck? That's in between the two sizes offered on Amazon. It's unclear whether there was once one size for Schott Zwiesel's Burgundy glass and they subsequently created a larger and a smaller variant. At any rate - my point in telling you all this is that Lot18 has these glasses this week. They're offering six 24.7 ounce Schott Zwiesel Forte Burgundy glasses this week. They confirm (via Twitter) that these are the 140 models you want. $59.99 with $9.99 shipping. Add a second item (wine or whatever they sell) and shipping becomes free. This may be a good deal if you happen to have some Lot18 referral credits clanging around - especially if you live in a state with tight wine shipping restrictions. Deal site Rue La La is running a $20 for $40 for Wine.com but you've got to act fast. The sale ends at 11:00 am EDT today (Sunday, May 13th 2012). The usual restrictions apply to this offer - most meaningfully that the voucher can't be applied to the price of shipping. Then head over to Wine.com to use your voucher. Check out the 2010 Belle Glos Meiomi Pinot Noir- always enjoyable and for my money the best $20 Pinot Noir on the market today. 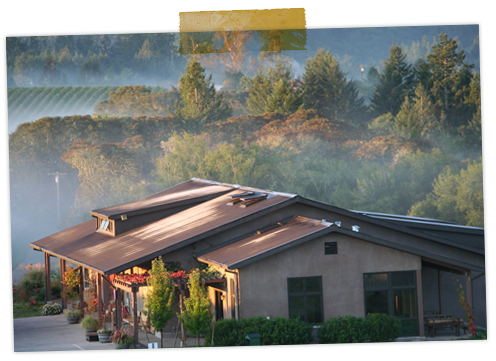 Littorai is a Sonoma based winery focused on the sustainable production of high end Pinot Noir and Chardonnay. Founded in 1993 by Heidi and Ted Lemon, they seek out sites with outstanding potential then let those vineyards reveal their unique character in the wines they produce. I visited Littorai a month or so ago and got a chance to see first hand what makes them special. When you talk about "off the beaten path" in Sonoma it has an entirely different meaning than in Napa. If you think a small mailbox with a family name is charming, try visiting Littorai. They take take it to the next level. Ask for a visit and you'll be greeted with directions and a gate access code for a property you'd never find on your own with no signage whatsoever. Founder, owner, and head winemaker Ted Lemon can seem like the grown-up in the room when extolling the virtues of terroir driven wines, balance, and the potential for California Pinot Noir and Chardonnay. What resonated with me about his message is that he's not looking simply to emulate Burgundy in California. He's looking to embrace the unique characteristics and capabilities of each site and deliver wines that speak purely to that site. When I visited I met with assistant winemaker John Wilson who most recently worked with highly regarded Thomas Rivers Brown of Schrader/Outpost/Rivers Marie fame. He took me for a tour around the thirty acre site - only three of which is dedicated to vines in the form of The Pivot vineyard. 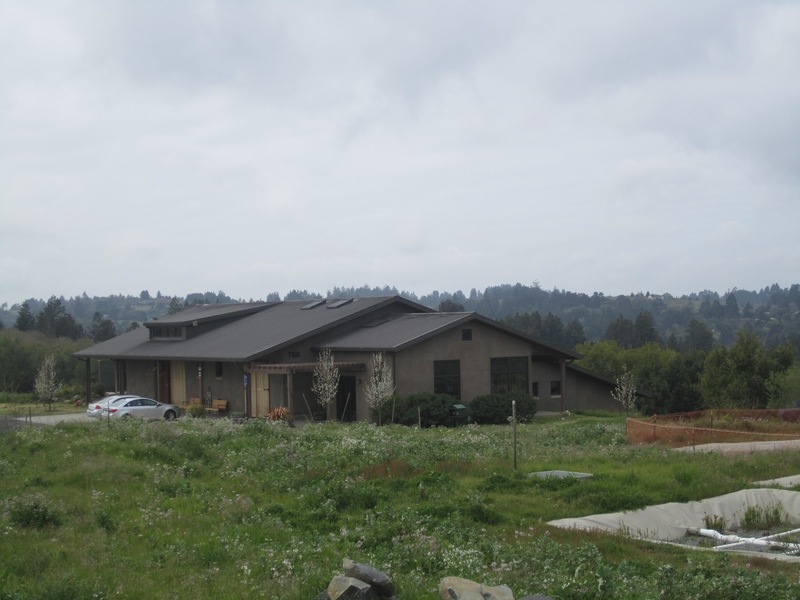 The site is also home to Littorai's winery which is built with hay bale walls and features gravity flow wine movement. We tasted through the Littorai Chardonnays first. Ted Lemon says "Chardonnay's first duty is to make you forget red wine." These white wines were brilliant and delicious and made me think I should drink more white wine - especially Chardonnay of this style. They're flavorful and powerful yet elegant and light. Really pretty. The Pinot Noirs showed fabulously as well, each with different characteristics that rang true to the Littorai focus of letting sites speak for themselves. All of the Littorai single vineyard Pinot Noirs are made exactly the same way. The only difference is the site. My only complaint with the tasting experience is that it was a little chilly so it was hard to differentiate the Pinots as much as I'd have liked to. The room felt south of 55F and I like to taste Pinot in the low to mid 60Fs. Aromatically expressive immediately upon opening with rounded edges of strawberry and raspberry fruit, spice box, and tea notes. Elegant on the palate with a touch of acidity and tannic grip, it's a pleasure to drink. Serious, but not overly so. This wine succeeds in finding the intersection between being terroir-driven and letting the site speak for itself and revealing the California sunshine. A tremendous introduction to the producer. Lemon was named winemaker of the year in 2010 by The San Francisco Chronicle. Check out this excellent piece by Jon Bonne. Littorai's wines can be hard to track down. You can do a wine-searcher.com search for retailers in MA that sell the wine but you won't currently find any. But check out The Urban Grape in Chestnut Hill if you're in the area. They've got a bunch of 'em. Case club? Question of the Day: Have you visited Littorai or tasted their wines? If so, what did you think? Either way, what are some of your favorite terroir-driven California producers? Kosta Browne Pinot Noirs are some of the most luscious, rich, ripe and delicious new world Pinot Noirs on the market today. 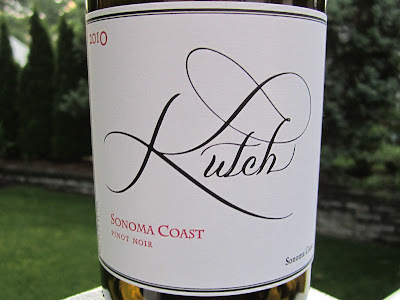 Their mailing list was already hard to crack before their 2009 Sonoma Coast Pinot Noir (95 points, $52) was named Wine Spectator's Wine of the Year. Now it's harder then ever to get an allocation of their wines or to find them at or near release price at retail. Their wines have a reputation for being big. Perhaps too big for some given the expectation that Pinot Noir should adhere to its Burgundian roots. But there's plenty of new world wine enthusiasts who unabashedly love the Kosta Browne style for its velvety mouth-filling texture, generous fruit, and hedonistic deliciousness. Myself included. This style makes Burghounds question: Are their wines age-worthy? The fruit will fade but the alcohol won't. Will these fruit bombs be in balance when they age? I spotted an older bottle of theirs on an offer from The Spirit Shoppe (long-time supporter of the WWP - check 'em out) so I thought I'd take a chance to see how well their wines hold up at 10 years post-vintage. I should mention up front that I enjoy wines on the younger side. I haven't had many "ah ha!" moments where I tasted a wine with significant age that made me want to invest in long-term cellaring. High quality Napa Cab is typically relased with about 3 years of age. California Pinot Noir is released earlier - about 2 years post-vintage. As a broad rule of thumb I'd say I like Napa Cab at around 4-8 years, Bordeaux at around 10 years, and California Pinot Noir at around 3-5 years. It's one of the reasons I like California Pinot Noir so much - it's a low-fuss wine. For me, Kosta Browne is the George Clooney of California Pinot Noir. Here's what I mean by that... When you watch an old episode of E.R. Clooney still looks cool. Contrast this with the style of Don Johnson in Miami Vice: Cool at the time but in hindsight a little extreme and now dated. Kosta Browne is like Clooney because it's maintained roughly the same style but has evolved over time. And thier style has been fashionable all along the way. Most other wineries envy their popularity, yet some may take swipes at them behind their backs. But you can't help but like them and want to hang out with them. Looking back to 2002, it was the year before their wines hit the big time and snared 95 point ratings from Wine Spectator. Their first publicly released wines were from the 2000 vintage. Spectator didn't rate their 2002 Russian River Valley Pinot but they did score the Sonoma Coast 87 points. When retasting it this year as part of a retrospective Kosta Browne review they rated that same wine 84 points. In other words it's a little tired. Slightly browning transparent brick red. There's a hint of what this wine once was on the nose with light fruit and a touch of herbaceousness. Nice full viscosity on the palate and a medium-length finish. Ultimately it seems like this wine has been reduced to its most elemental components: Some fruit up front, weight on the palate, and alcohol in the background. Tasting this wine felt like walking through Cooperstown right before closing on a quiet night. You can see the markings of a star early in their career but they haven't started to put up the .300/30 HR/100 RBI numbers just yet. A fascinating experience tasting this wine early in Kosta Browne's trajectory. 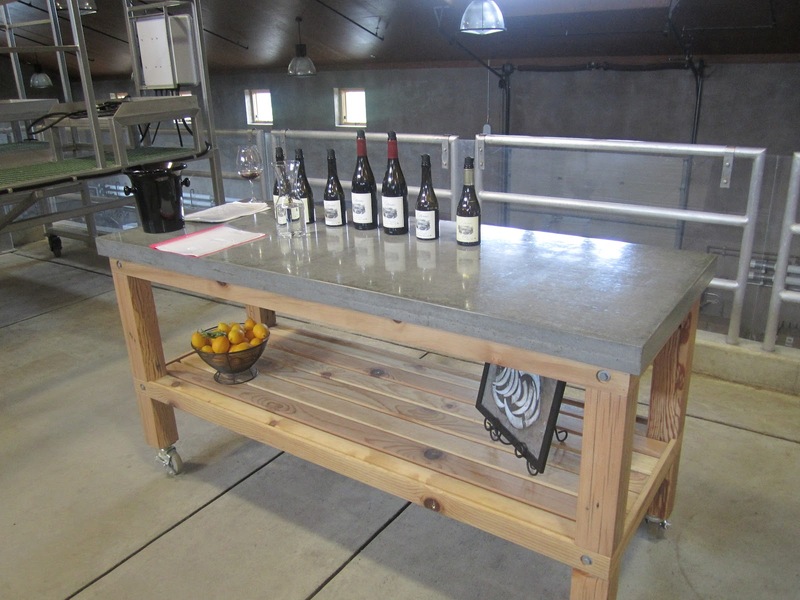 Visit the Kosta Browne website to learn more and sign up for their mailing list. Question of the Day: What drinking window is your benchmark for high quality California Pinot Noir?